The Pin It button has been available to websites for quite some time, but it’s always a great refresher for those just entering the Pinterest world. The Pin It button is a fantastic way for web site owners to drive referral traffic to their sites and engage users with the site’s content. The Pin It button lives within a site’s content and is appended to an image’s possible functions. 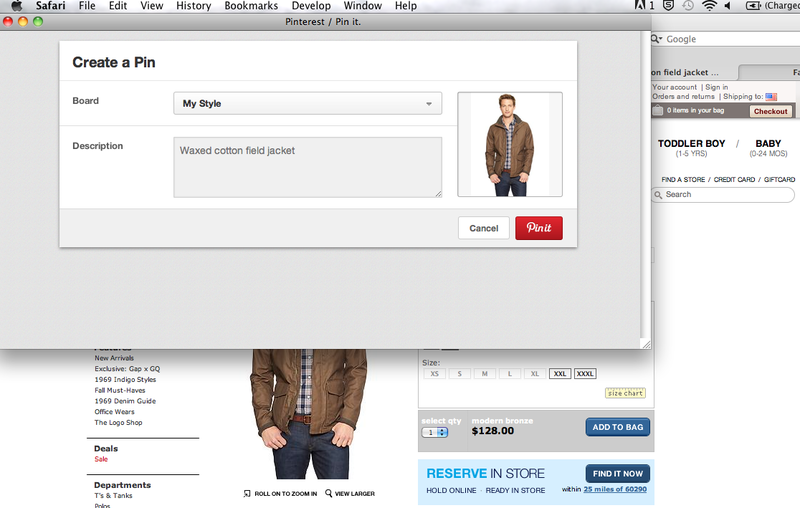 In the below example, Gap has placed the Pin It button against the jacket. When the Pin It button is applied in this fashion, it allows visitors to pin an image from the website onto their Pinterest boards. When someone clicks “Pin It” under the Gap jacket, a window pops up with the jacket’s image. Then, the user can select a board they want to pin the image to, as well as make any comments against the pin. Once the user selects “Pin”, the pin gets placed onto their selected Pinterest board. It is then shared with all of the followers of that board, along with anyone who searches relevant keywords against the description of the pin. Pinned content is shared with a user’s followers on Pinterest. Adding the Pin It button to your website means increased exposure. For starters, simply bringing an image from your site onto someone’s Pinterest boards means someone has engaged with your content. This shows interest in what your site offers. Secondly, once one person pins an image from your site, other people see this user’s content on Pinterest. If they are interested in your image, too, they can repin, favorite, or comment on your image. This means even more engagement with your content and additional exposure. Finally (and most importantly), the Pin It button can provide huge lifts in referral traffic to your site. All Pinterest pins let users to click on the image to see the original source of the content. This means that anyone who clicks on the image that was pinned from your website is linked back to your website. This includes any repins, favorites, or comments. Given the great things the Pin It button can do for your site, it’s important to track its performance. Changes in referral traffic from Pinterest can signal that users are engaging with your content differently. If you see a large increase in traffic one day, perhaps your content was extremely relevant, or was repinned by a Pinterest user with a lot of followers. A decrease could signal that your content needs to be updated, or even that there may be an issue with the button. It’s easy to track performance with tools like Google Analytics, Pinterest analytics, and third party companies like Curalate.